I'm from that post-war Baby Boom generation that grew up in the Golden Age of Halloween. We bought - or improvised - a costume and happily went trick-or-treating from building to building (and apartment to apartment within each building), bringing home candy, apples, and not a few coins. Halloween has an inherently transgressive dimension - like all such once-a-year topsy-turvey holidays (e.g., "Feasts of Fools" and Holy Innocents Day festivals in the Middle Ages). That transgressive dimension survived symbolically in the donning of a costume, the assumption of a false identity (heroic or royal) which one was not entitled to in ordinary life or which one would not normally want in ordinary life (witches, ghosts, etc.). But otherwise it was all pretty much tamed by my time and was understood to be more fun than frightening or threatening in any way. Since then, Halloween has become fraught with fears of a different sort. Parents now accompany their children as protection, and candy is carefully scrutinized for safety. In some places, the Nanny State has even taken it upon itself to regulate the time and date of Halloween - even rescheduling it to an alternative day, thus depriving it of its vestigial historical and religious symbolism. It may indeed be true, as the censorious scolds of "political correctness" contend, “that the melding of cultures is often about which group has the power to take symbols, styles or language from another.” But it is likewise true that such power differentials are more than symbolic in origin and that they remain largely intact unless more serious substantive conditions are addressed. Policing language - so favored by cultural elites - does not in itself accomplish that. In any case, what this misses is that the whole point of transgressive holidays like Halloween is to permit precisely what is normally not acceptable, even while keeping the transgressions within certain restraints, within the bonds of "fun." Of course, not every transgression is fun. Insensitive forms of mockery that are more insulting than fun are rightly reprobated. No one I ever heard of or saw when I went trick-or-treating, ever dressed up as Stalin or Hitler, for example. But a sane society can make sensible distinctions between what is totally out of bounds and what is only moderately so. And such a society also provides serious moral education and character formation for its young that enables them to learn to make those necessary distinctions. But a society that becomes so rigid that it cannot accommodate any ritualized transgressive behavior at all is in serious danger of being a society in which no one will ever be able to have any fun at all. But, back to Halloween, which has also come under fire from religious groups as well. According to Terry Mattingly in today's Knoxville News Sentinel - "Good vs. evil influences of halloween festivities considered" - many religious people are increasingly less likely to see Halloween as just "all in good fun." Apparently, Catholics have a more favorable view of the holiday (71%) than many Protestants (only 41%). This, the author suggests, may reflect the historical connection of Halloween with All Saints Day. Thus Fr. Steve Grunow of Word on Fire Catholic Ministries is quoted as saying we need to affirm what Halloween meant in the past while rejecting the "violent, macabre" themes and "pop-culture images" of "today's secular holiday." Therein, I think, lies the real challenge, since the secular holiday has largely overtaken the original religious significance of Halloween and All Saints. In moving the feast of All Saints from May to November, the medieval Church was symbolically celebrating the triumph of Christ over the demonic elements traditionally associated with the pagan festival we now call Halloween. And, in so doing, it also celebrated the historical triumph of Christianity over pre-Christian European paganism. If Halloween is now a $7 billion extravaganza that now largely overshadows All Saints, perhaps it may likewise be becoming a symbol of the cultural triumph of a new post-Christian paganism over a Christian faith increasingly being consigned to the past. If that is the case, then I am all for re-thinking and ultimately even abandoning Halloween. That said, I went to the store this morning and stocked up on candy to give "all in good fun" to tonight's trick-or-treaters, whatever the holiday may actually mean to them! It Was Twenty Years Ago Today ... So begins Paul McCartney's Sgt. Pepper's Lonely Hearts Club Band, the title song of the 1967 album of the same name. Here, however, I am writing rather than singing about it; but 20 years ago today at Saint Peter's Parish (then the Paulist Fathers' Canadian parish in Toronto, Ontario) I was finally ordained a priest by Jesuit Bishop Attila Mikloshazy (then the Bishop for the Pastoral Care of Hungarian Emigrants). Recently I found some 20-year old photos of that happy day, and today I posted them on Facebook - photos of the ordination ceremony itself, of my parents and Toronto parishioners at the reception afterwards, of Paulists who attended, and one of my first Mass the next day in the Paulist Fathers' House Chapel. An ordination anniversary is an occasion for many emotions, for grateful remembrance of all those people who were there, some of whom have since returned to the Lord, and for prayerful reflection on the awesome ministry entrusted to me on that day by the grace of God, the hands of an Archbishop, and the decision of the Paulist Fathers. So, as always on this day, I begin by recalling the words preached by the great Saint Augustine of Hippo on his own anniversary of the day when he became a bishop, a responsibility, he noted, "for which it will be no easy task to render an account." "When I remember," Augustine continued, "by whose blood I have been redeemed, this thought brings me peace, as though I were entering the safety of a harbor; and I am consoled, as I carry out the arduous duties of my own particular office, by the blessings of which we all have in common. ... To be a good shepherd I depend entirely on his grace, for without his help I should be a very bad one, there is so much evil in me. Pray, then, that I may not be a bad shepherd, but a good one. ... Make my ministry a fruitful one. You are God's garden, and you should therefore welcome the laborer who does the visible work of planting and watering the seed, even though the growth comes from one who works invisibly within you. Help me both by your prayers and by your obedience, for then it will be a pleasure for me, not to preside over your, but to serve you." [Sermon 340]. While we still await an official English-language translation of the Synod's Relatio, some of the more widely circulated (unofficially translated) paragraphs invite some initial reflection. Such, for example are paragraphs 69-71. I have long thought that, just as there are individuals and communities linked with the Church by baptism but in imperfect communion with her and others who although unbaptized are also related in various ways to God's people (Lumen Gentium 15-16), so too also it makes sense to think that within the Church different people experience different degrees of connection with the community and life of the Church. Such, for example, are those in irregular unions - whether unmarried cohabiting couples or divorced and civilly remarried couples. The Synod certainly recognized the need to address people in such situations with pastoral care and discernment. Thus, paragraph 69 highlights marriage as a faithful and indissoluble union open to life, a grace for humanity which the Church joyfully proclaims to all people in all contexts. That said, the Synod recognizes that there are also situations in which this religious reality is not appreciated. The Synod invites the pastors of the Church to find ways to keep dialogue open with those in such situations and to be alert to whatever in those situations may promote people's human and spiritual growth and may provide opportunities for evangelization.Paragraphs 70 and 71 consider some of the material and cultural circumstances that may dispose unmarried couples to cohabitation and may make marriage appear impractical. Again, recognizing the existence of these realities, the Synod invites us to discern how such circumstances can become opportunities for deeper engagement with the Gospel message about marriage and family, as opposed to simply serving as obstacles. Likewise, the Synod looked also at the increasingly sensitive situation of those who are divorced and have since remarried civilly. Paragraph 75 alludes to the particular difficulty often experienced here in the US when a complicated marital situation gets in the way when someone subsequently seeks entrance into the Church. Paragraph 84 sets out the also not uncommon situation in which divorced and remarried couples are - or aspire to be - active in the Church's life, and challenges the Church to discern how to maximize that participation , while avoiding scandal. Interestingly, the text suggests that, rather than being seen as a diminished commitment to indissolubility, such outreach to the divorced and remarried may be seen as an expression of the Church's charity, which at least sounds like a more positive way to present it. Paragraph 85 is especially significant n regard to the formation of conscience in particular case. It emphasizes the already recognized principle that the objective status of an action is not necessarily identical with subjective imputability, which may be affected by various factors. This leads in paragraph 86 to a cautious consideration of the kinds of conversations that might helpfully take place in the internal forum. Here especially is where conflicting interpretations are competing for world attention. Is this therefore a path to Communion for the divorced and remarried (as some are interpreting it), or does the fact that that possibility is nowhere explicitly mentioned mean that it most certainly is not such a path (as others are insisting). It remains to be seen both how this will be incorporated into whatever Exhortation the Pope eventually issues and how it will be implemented in actual pastoral practice. What the Synod certainly did do was to affirm traditional doctrine about marriage in a way which, avoiding gratuitously condemnatory language, was sensitive to the real-life complexities in which many families find themselves today. It is easy to see how the secular media may run with some of the sentiments expressed in these paragraphs and create an impression that some doctrinal Rubicon has been crossed - even though much of what is being proposed in these paragraphs is not radically new and reflects aspects already found in pastoral practice. A culture unfamiliar with the living actuality of the Church's doctrine and pastoral practice may well create a new narrative which will drive the discussion. It remains to be seen whether and how the Holy Father will create from all this a more compelling religious and spiritual narrative to drive the discussion within the Church community and compete effectively with the otherwise dominant secular narrative. As of this morning, no official English translation of the Synod of Bishops' final Relatio has been produced. Only some of the more controverted paragraphs have been easy to access in English (albeit in unofficial translations). Much of what is said in those paragraphs seems helpful and attractive. But any serious reaction to the actual contents of the Relatio will just have to wait until there is an official English text to treat. Meanwhile, however, there has been no end of commentary - some of it quite contradictory - about the event of the Synod itself and about the way it has concluded, all of which does deserve some preliminary and perhaps tentative reflection. The paragraphs of the Relatio that have gotten the most attention are also, of course, the ones that passed with the smallest margin of votes. It must be acknowledged that, unlike the case with the 2014 Relatio this time every paragraph managed to muster the required 2/3 vote - although in one case it was apparently by just one vote. This tells us two things about the controverted paragraphs. There was probably enough ambiguity in the texts to create the required consensus to pass them (not unlike what seems to have happened at Vatican II), but there was still strong opposition even given the ambiguities built into the texts (which was not the case at Vatican II). During the Synod much of the acknowledged conflict centered on arguments about the Synod's process. Perhaps the highpoint of that was the imbroglio about the letter from the 13 Cardinals, who apparently took seriously the Pope's invitation to speak freely and so questioned some aspects of the process. The vitriolic invective that has been directed in some quarters against the 13 Cardinals and their letter confirms what every serious student of politics knows (or should know) - namely that arguments about process are rarely really just about process and are primarily about the substantive outcomes which this or that procedural arrangement is likely to produce. Presumably, the critics of the 13 Cardinals and their letter saw Their Eminences' procedural concerns as a reflection of a substantive agenda the critics did not completely share. Hence the nonsense about the Cardinals being somehow disloyal to the Pope - it being seen by some as disloyal to do what Cardinals are theoretically supposed to do, i.e,. advise the Pope. The other leitmotif flowing through the coverage of the synod has been whether some sort of doctrinal Rubicon was about to be crossed. The secular media has a certain interest in presenting the Synod's debates that way, of course. Whether or not they are correct - and whether or not the media's Rubicon and the actual Rubicon (if there was one) are exactly the same also remains to be seen. Ultimately, we must wait to receive the Pope's Post-Synodal Apostolic Exhortation (or whatever alternative form his response to the Synod may take). What is already evident, however, is that the very public factional conflicts at this Synod did not come out of nowhere and reflect real, substantive conflicts within the Church - in some cases, between particular groups within the Church (for example, between the poor but growing church communities in Africa and the rich but increasingly moribund church communities in Europe, especially German-speaking Europe). The vibrancy of the African Church communities at the "peripheries" did not preclude the at least partial success of the European Church's agenda. On the other hand, the European Church's successes at the Synod are hardly likely to stem either those communities' long-term trajectory of decline or the increasing influence of the Churches at the "peripheries." Again, without access to the entire document in an official English version, it remains problematic to comment on specifics. From the reports so far and from the widely circulated translations of the more controversial paragraphs, it may be possible to suggest some general observations. For one thing, if the reports are accurate, it does seem that the critiques of the Instrumentum Laboris were taken to heart and a final Relatio was produced that is more theological and scriptural, which would seem to be a good thing in what is, after all, a religious rather than a sociological document. Secondly, as with Vatican II, it remains to be seen how much weight what the Synod actually said will carry, and how much concepts like "the spirit of the Synod" and "the Synod as event" will facilitate a greater variety in interpretation. Here too, however, we must await what Pope decides to do. Unfortunately, such is the dynamic of polarization, that, regardless of how the Pope interprets the Synod and implements his interpretation, it will still always be possible for either side - or both sides - to object to any particular interpretation and implementation. Remember how one side saw Pope Paul VI as going way beyond any appropriate interpretation of Vatican II in terms of what he did with the liturgy, while another side saw him as regressing from the "spirit" of the Council in Humanae Vitae. “The ‘style’ of our mission should make our hearers feel that the message we preach is meant ‘for us’.” That is what Pope Francis told the US Bishops at Saint Matthew’s Cathedral in Washington, DC, just over a month ago. No doubt that was how Jesus made Bartimaeus feel that day that he passed through Jericho with his disciples and a sizable crowd [Mark 10:46-52] – an exciting, glamorous occasion for the locals, not unlike when the Pope Francis visited Washington, New York, and Philadephia last month. In contrast, of course, most people (most of the time) try to ignore beggars as much as possible. Most likely that had been Bartimaeus’ experience. So no wonder he made such a nuisance of himself! He had to - just to attract Jesus’ attention, just to get noticed at all! The crowd, of course, tried to shut him up – until Jesus did just the sort of thing that he was becoming famous for doing. No doubt to the chagrin of the disciples, who were probably enjoying the parade and their part in it, Jesus interrupted his parade to attend to some beggar, a person of no noticeable importance, a nobody – reaching out (as Jesus so often did) across the boundaries that are supposed to keep people in their proper places. (Notice, however, how quickly the crowd got with the program. As soon as the people realized that Jesus was actually interested in Bartimaeus, suddenly their scolding turned into encouragement). Jesus’ simple question, “What do you want me to do for you?” was the same exact question that he had asked James and John in the Gospel account we heard last week. What a difference in response, however! The answer that they gave was what one would expect from 2 young, talented, upwardly mobile disciples, just beginning their ecclesiastical careers. “Grant that in your glory we may sit one at your right and the other at your left.” Poor blind Bartimaeus simply said, “I want to see.” Unlike James and John, Bartimaeus wasn’t on any fast track to anywhere. He was, in fact, on a very slow track to nowhere, and he knew that perfectly well. In his closest companions and dearest disciples, Jesus unsurprisingly found overwhelming ambition. But, in Bartimaeus, he found faith. The story could have ended right there - an uplifting, edifying story with a happy ending. But it didn’t. In spite of Jesus’ instruction, “Go on your way,” Bartimaeus did no such thing. Instead, we are told, he followed Jesus on Jesus’ way. Having himself found healing and salvation, he wanted to share what he had found with others. Bartimaeus seems to have immediately understood what eluded James and John – what James, John, and the other disciples, for all their quality time with Jesus, still abysmally failed to understand – namely that God’s gifts are not given just for ourselves, but are meant to be shared with the whole world, this world which God loves so very much that he has chosen to be a part of it. Like Bartimaeus, Saint Paul understood this. If I preach the gospel, this is no reason for me to boast, Paul famously wrote to the Corinthians, for an obligation has been imposed on me, and woe to me if I do not preach it! Like Bartimaeus, all of us have been changed - and challenged - by the transforming power of Jesus Christ. And so, like Bartimaeus, we now have to live that change, in our ordinary everyday lives as believers, in the wide and complicated variety of situations in which we find ourselves. In other words, we should mean what we say when we pray in the Lord’s Prayer that God’s Kingdom come and his will be done on earth. For, in the end, we may well be the only experience of Christ most people will ever have in life - the face of Christ they see, the word of God they hear. So if, for whatever reason, we fail as credible – and inviting – witnesses, then we run the risk of concealing rather than revealing the face of Christ. Then the word of God may seem strangely silent - precisely when and where it most needs to be proclaimed. The love of God may appear absent, if it isn’t being shared. It’s always tempting to be satisfied with the way things are. The crowd in Jericho was content to keep Bartimaeus quietly on the side of the road, quite literally in the dark. By not keeping quiet, Bartimaeus helped the crowd too to experience something beyond the limits of their previous experience – something to be shared with the whole world, a world whose only alternative would be a future spent in darkness. In the dark, Bartimaeus symbolizes so well the human condition apart from Christ and in obvious need of an alternative to the way things are. Following Jesus as his disciple, Bartimaeus exemplifies what we can all become through the transforming power of God’s mercy present and active in our world. The crowd in the Gospel got the message. Once they realized what Jesus wanted, they changed their attitude and, instead of hindering him, helped him to follow Jesus. The truly happy ending of this story will be when we, all of us, have likewise done the same! Homily for the 30th Sunday in Ordinary Time, Immaculate Conception Church, Knoxville, TN, October 25, 2015. In the Paul VI liturgy, the feast of Christ the King has been relocated to the last Sunday before Advent (this year, November 22), thus situating its celebration in a more explicitly eschatological and apocalyptic context. 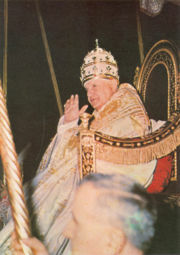 This new emphasis is also reflected in the expanded title of the feast in the Paul VI calendar: D. N. Iesu Christi universorum Regis ("Our Lord Jesus Christ King of the Universe"). Of course, this eschatological/apocalyptic/cosmic dimension was not completely lacking in the original feast of Christ the King, as established by Pope Pius XI in 1925. It was implicit in the dating of the feast in relation to All Saints Day, the original eschatological/apocalyptic feast par excellence, which brings the Church's annual cycle to a fitting conclusion in the contemplation of the final harvest of the Kingdom, of which Christ's earlier resurrection was "the first fruits" (1 Corinthians 15:20). But Pius XI's feast, assigned to the Sunday before November 1 (this year, October 25), was less ostensibly cosmic in its focus and more explicitly social in its emphasis. 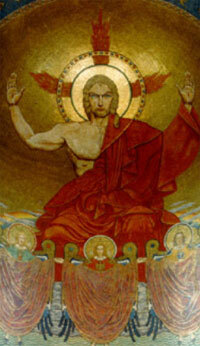 Instituted as the Holy Year of 1925 was coming to its end, with the "Roman Question" still unresolved and in the tragic aftermath of the pointless First World War, which had represented what Pope Benedict XV had called "the suicide of civilization," the feast of Christ the King reflected a decidedly contemporary, less future-oriented preoccupation. This was also reflected in Pius XI's prescription of the annual renewal of the Act of Consecration to the Sacred Heart on the feast of Christ the King. There is, of course, no contradiction between Paul VI's Christ the King who reigns at the right hand of his Father and will come again to judge the world and Pius XI's emphasis on Christ the King ruling over and calling to account the principalities and powers of this world right now. They are actually quite complementary, and both deserve liturgical and devotional emphasis. So, even though the feast is no longer celebrated this weekend, we would still do well to recall what Pius XI wanted us to reflect upon annually on this last Sunday in October. We won't know until the Synod Fathers release their final document, what if any consensus has developed and what if any priorities the Synod Fathers plan to propose to the Pope. Since the Synod itself is a consultative, advisory body not a legislative one, we will also have to wait to see what the Holy Father does with whatever recommendations the Synod gives him, whether he will issue an Apostolic Exhortation, as has been the custom after past synods, or what other actions he may choose to take. So the Synod as an ecclesial event, as a chapter in the Church's history, may yet surprise us. That said, I am already surprised at how little the Synod seems to have focused on the kinds of concerns that one might have expected Pope Francis to want it to address. Instead, the emphasis - at least as filtered through the obviously 1st-world media - seems to have been not on the suffering, poor, and war-ravaged 3rd-world "peripheries," but on concerns characteristic principally of the 1st-world, the rich world. Perhaps the predictable preoccupations and obsessions of the secular 1st-world/rich world media made that inevitable. Perhaps the Pope's having earlier offered a very visible forum for the distinctive preoccupations and concerns of the (super)rich German Church also made that outcome almost inevitable. But it still surprises me that an assembly of bishops representing the entire world has become so entangled in the preoccupations and concerns of primarily this part of the world. Well, we await the synod's final words and, more importantly, what the Holy Father chooses to do with them. And then we will all be better positioned to evaluate this Synod's significance as an event in the Church's contemporary history. It also occurs to me, from reading the reports of the English-language groups, that the Synod Fathers seem to have had to digest and process an enormous amount of material in a relatively short span of time. I wonder whether the whole format for such synods might well be rethought. Perhaps synods might meet less frequently but for a longer time - with substantial interludes for committee work and discussion. The Synod of Bishops is a relatively new institution in the church's life - just barely 50 years old. Its long-term value as a serviceable institution has yet to be determined by experience. But, if it is to serve its presumed purpose as an effective advisory body, assisting the Holy Father in his ministry in service to the Universal Church, then some future rethinking of its structure and processes may be helpful. Fifty years is a long time! And it has been a very long time since my classmates and I last left our high school behind - leaving behind not just our particular Boomer generation's distinctive experience of adolescence, but also (and more than we could ever have anticipated at that time) leaving behind a whole way of life. The High School itself has been closed for almost half of these 50 years. Built as an expression of post-war prosperity and confidence, as well as the zeal and enthusiasm of the mid-century Church in America, it closed in 1991 - a casualty of the loss of so much of that zeal and enthusiasm, rooted in a collapse of our cultural confidence. Last night, however, was not another occasion for such somber thoughts. Rather it was a celebration of one another and of the memories we share from a world long gone. Because it was very much a neighborhood school, many of us enjoyed a connectedness with one another and with one another's families that preceded high school and in some cases perdured. Meanwhile, we have for the most part all gone our various separate ways, along the paths life has taken us. We have become judges and lawyers, policemen and priests, teachers and truck-drivers. And in that sense certainly, the school did a good job! "Wake Up the City" is the theme of a film series being shown at the Paulist Mother Church this weekend in observance of this Year of Consecrated Life. In town today to attend my 50th High School Reunion, I took advantage of this morning's showing of The Nun's Story, the 1959 movie, starring Audrey Hepburn, based on a 1956 novel of that name, which was in turn based on the real-life vocation story of a Belgian nun who served in the Congo but then left the convent during the 1940s German occupation of Belgium. My understanding is that the movie follows the book fairly faithfully, although the motive for her leaving religious life at the end may be more political in the book than in the movie, where the occupation seems more like a crisis that precipitates a long simmering resolution. I don't really remember ever actually seeing the movie in the theater, although I may have. I have certainly at least seen some scenes of it on TV over the years. So I sort of knew the story but didn't know it completely, one reason why I took advantage of the chance to see it this morning. It's a wonderful film, well made and beautifully filmed both in Belgium and in the Congo - the Belgian Congo, as it then was. It portrays religious life, as it was then lived, very faithfully - and sympathetically. There are no stereotypically mean or pathological nuns, indeed the nuns are generally portrayed as being committed both to their religious calling and to their ministry as nurses and similarly as being compassionate and kind to those they serve and to one another. Sister Luke (Hepburn), although consistently portrayed as struggling with obedience, is likewise competent and compassionate and sincerely dedicated to her religious calling. And her superiors are likewise portrayed as compassionate, caring, and supportive of her in her struggles. The story may be based on a real-life vocational journey, the authenticity of which deserves our respect; but frankly I personally found the portrayal of Sister Luke's inner conflict somewhat overdone. Everyone who sincerely embraces religious life experiences inner conflicts. Some resolve them by not persevering, which may be the right decision for them. But those who do persevere learn to live with their inner conflicts as good religious, even if not quite meeting an abstract standard of perfection. In Sister Luke's case, she excelled at her nursing ministry, for which she was loved and respected. In real life, such a person probably would have been tapped for leadership in her community. Certainly I suspect avenues would have been found for her effective use of her talents and strengths within the mission of the community. 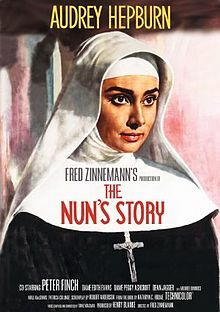 I understand what the film is trying to get at in harping on the difference between being a good nurse and being a truly perfect nun. But in the real world, most of us learn not to let the perfect be the enemy of the good, or at least not to let it de completely decisive in resolving the conflict. And that is precisely how one could interpret what went wrong in Sister Luke's life. In the Congo, Dr. Fortunati discerned how her perfectionism was taking its toll on her health. The story seems to suggest that, while the strain on one's physical health could be healed, that on her emotional and spiritual life could not be. But why should that be so? What this otherwise wonderful evocation of religious life and missionary life seems unable to do is to recognize how sincerely striving for perfection can still be compatible with never quite completely achieving it, and that in this world religious life lived faithfully in that in-between may be itself a true form of witness. Back home in New York for my 50th High School Reunion tomorrow, I took the bus over to 5th Avenue to check out the recent restoration work at Saint Patrick's Cathedral. It was well worth the effort. Since it was opened in 1879, Saint Patrick's Cathedral has been not only the heart of this great archdiocese but in so many ways the spiritual hub of this great city, as well as a treasured cultural and artistic landmark and always popular tourist site. That was so even when it was dark and grimy from a century of candle smoke! It is no less so now that no effort has been spared to restore its beauty and sparkle. In the process, some well-intentioned but unfortunate recent renovations were undone. Added to the main sanctuary for several years, the old Holy Family altar gratuitously duplicated the function of the High Altar while taking up space and breaking the sight-line from the nave to the main altar. That additional altar is now gone. Where to? Hopefully, it may be eventually restored to its original place at the northeast end of the transept. Likewise, the wooden Gothic canopaoeum over the pontifical throne has been restored to its rightful place. Work is still being done at the Sacred Heart altar, but all the other side altars seem to be set. I stopped to light a candle at the altar of Saint Therese of Lisiuex, to venerate her exposed relic and to honor her parents whom Pope Francis will canonize in Rome on Sunday, as a fitting complement to the current Synod on the Family. The Blessed Sacrament was exposed in the Lady Chapel. So I couldn't take any pictures there, but the Chapel and its glorious windows were gleaming. It was also nice to see 24 candles lit at the altar of exposition - no modern minimalism there! My one disappointment was that the 1970s statue of Saint Elizabeth Seton is still in place. She certainly deserves a statue, and the one there is not per se ugly and would probably look fine in some other location, but it still screams 1970s and so clashes excessively with the cathedral's dominant style. That minor quibble aside, it was a joy to be back in that great cathedral, which I have visited so many times in my life and to see so many other tourists and pilgrims visiting and praying there. The small groups have reported in from their deliberations about the second part of the Instrumentum Laboris. Like the reports themselves, my comments this time will be briefer, and will again be confined exclusively to the English-language reports. English Group A ("Circulus Anglicus A") again began by referencing Jesus and argued for a more abundant use of scripture, especially the exemplary accounts of Old Testament couples. Group A emphasizes the family's vocation within the context of the "universal call to holiness" and the family as "the first and primary evangelizer in which one discerns a vocation to a particular state in life." I suggests identifying "best practices" to "show families how to more fully and faithfully live out their vocation." Finally, it calls for both "streamlined, attractive language" and "ell-grounded explanations of church teaching on marriage and the family." Group B called for "a much more detailed reflection on the Family and Divine Pedagogy." It employs the classic contrast between marriage as created in Genesis - "monogamy, permanence, equality of the sexes" - and "the reversal of these basic characteristics as a result of sin." Seeking "a language accessible to the men and women of our times," it proposes "alongside the term 'indissolubility' to use a language which is less legal, and which shows better the mystery of God's love speaking of marriage as a grace, a blessing, and a lifelong covenant of love." Echoing Group A's affirmation of the integration of scripture study and reflection into the lives of families, Group B focuses on "the centrality of the Word of God in the theology of marriage, in the pastoral care of the family, and in family piety." It identified as a goal for every couple and family "worshipping together faithfully at mass every Sunday" and stressed Catholic schools as "an extension of parish and family catechesis." Group C repeated the need to speak positively to families who "are living their Christian marriage as a genuine vocation." It called for culturally attuned catechetical programs and resources for family prayer and identified "need to explore further the possibility of couples who are civilly married or cohabiting beginning a journey toward sacramental marriage and being encouraged and accompanied on that journey." Like Group B, it suggested presenting indissolubility "as a gift from God rather than a burden" and finding "a more positive way of speaking about it." It seeks "presenting the Bible as a matrix for Christian married and family life," not neglecting sacrifice and suffering, with an awareness of "how the Church through the ages has come to a deeper understanding and surer presentation of the teaching on marriage and the family which has its roots in Christ himself." Wary of "too simplistic a reading of a complex phenomenon," it calls "for a more nuanced understanding of why young people these days decide not to marry or delay marriage" and cites the view of marriage "as a purely personal or private matter," "a culture of options which baulks at closing doors" and "powerful economic factors." Finally, it suggests identifying "practical initiatives or strategies to support families and to help those that are in trouble." Group D also sought more reflection on scripture. It raised the issue of "the relationship between the newness of the Christian sacrament of matrimony and the natural structure of marriage built into God's plan from the start." It criticizes the IL for not defining marriage and proposes correcting tht by incorporating the definition in Gaudium et Spes, 48. This group also raised the question of framing "indissolubility" in a more positive way. It worried whether Mosaic divorce was being presented as a stage of God's plan, whereas "divorce is never part of God's will for humanity, but was a consequence of original sin." I particularly liked the observation "that priests are not trained to be marriage counselors" and so "should move away from marriage counseling and do clearly defined spiritual guidance instead." Overall, there seems to be widespread dissatisfaction with the Instrumentum Laboris, stressing its scriptural and theological limitations. There seems to be a widespread desire to reaffirm the best of the Church's teaching on marriage and family, to (so to speak) say the same thing, but say it in a newer, nicer way. This could be either very promising or a dead-end. Which it will be remains yet to be seen. How we speak about marriage may be part of the problem some people experience, but it may not. And again the desire to affirm the positive experience of faithful marriages and to be more of a useful resource for faithful families strongly stands out. Last night's Democratic Debate was, well, a debate - an adult affair in which serious people talked about serious issues - in almost every respect the opposite of the adolescent "debates" the opposing party has sponsored so far, full of name-calling, high-school caliber insults, and dramatic refusals to deal with existing realities, like climate change and the actual balance of power in the world. Just watching candidates discuss - and disagree - seriously and civilly was a poignant reminder of what democracy once meant. Even the minor candidates, whose substantive contributions were relatively minimal, managed to look and sound more presidential than many of the contestants in the previous "debates." Since the candidates were not acting primarily as entertainers, there were fewer standout moments. The most memorable such moment was, I suppose, when Bernie Sanders dismissed the media-driven Clinton email "scandal," to the rapturous applause of most of the audience. The media, of course, lives by its own set of self-induced obsessions. So we are not likely to see a dramatic change in the coverage, at least not in the short term. But at least ordinary Democratic voters got a chance to express their desire for a campaign focused on the pressing problems currently afflicting our country rather than on the personality and scandal-oriented obsessions of the elite media class. Hillary Clinton obviously had a great night and probably further solidified her position. Her performance showed the value of years of experience and careful attention and preparation. Bernie Sanders kept bringing the discussion back to his core concerns, which highlight much of what really ails the country. Undoubtedly it is thanks to him that economic inequality and its social and moral consequences has become so much more prominent as an issue. And he is correct, of course, in his diagnosis of the socio-economic and moral source of so much of our contemporary distress - the determined undoing of the social fabric of our national community that began with the election of 1980. He is probably also right in his view we would all be better off with Medicare for all - as Richard Nixon was once willing to propose in 1973. I have mixed feelings about "debates," having lived through the whole history of such events - as an ordinary citizen, then as a political scientist, and now as an ordinary citizen again - since their modern origin in 1960. They can easily degenerate into theatrics, and too much can stand or fall with one ill-chosen sentence. (Remember what happened when President Ford inadvertently liberated Poland in his 1976 debate with Jimmy Carter!) On the other hand, they are the one and only opportunity for candidates to challenge each other directly and to engage each other in a conversation that is at least potentially not completely scripted beforehand. And there is certainly something to be said for that! The Leftovers returned to HBO for its second season a week ago - to overwhelmingly positive critical acclaim. Personally, I couldn't quite decide what to make of the first episode, which introduced a cast of new characters and was set in a completely different location. I get it that the material from the original novel on which the series was based had largely been used up. And it was certainly quite a creative turn to take off in such a seemingly different direction. But moving from New York to Texas has no more appeal to me on TV than it would have in real life! And I like stability enough to want to tie together the loose ends of the first season's overwhelmingly sad stories and their bleak characters together, before simply moving on. So I waited for the second episode to air, which presumably would backtrack to where season one left off and take us through the process of getting from New York to Texas. In Season One, we had to wait until the penultimate episode to see what the characters were like before the Departure changed all their lives. In Season Two we only had to wait for the second episode to pick up where season one left off and find out how the Garveys, et al, ended up in Texas. Picking up where season one left off, with Nora discovering Holy Wayne's baby on Kevin's porch, Kevin and Nora and Jill (and the baby) try to start anew, creating a blended new family unit. that still leaves out a few people. Kevin's father gets discharged from the psychiatric hospital, but plans to relocate (at this age!) to Australia. Since that could have happened without his personal appearance in the episode, I'm guessing he may reappear at some point in the season. Son Tom is still in town, although unknown to Kevin. We see Jill secretly meeting him for lunch and would like to hope they could restore the connection they had when we last saw them together forming a "circuit" on Departure Day. It's unclear just why Tom won't come back, but he clearly resists Jill's wishful thinking that everything is now OK again with Kevin (presumably thanks to Nora). Only when Tom leaves and we see him drive off with their mother do we realize why he won't come home. For all his voices and craziness, Kevin still seems to me less wacky than Laurie, but, of course, she is Tom's real mother, while Kevin is not Tom's true father. But my guess is that they will reappear soon enough. Jill's assertions that all is OK to the contrary, clearly all is still not well in Garvey-land, starting with inside Kevin's head where Patti's no longer silenced voice still haunts him. He confesses to his family about burying her, but does not reveal the problem he really needs help for, namely the voices that still haunt and torment him. After having to meet a whole new family in episode one, it was nice to return to our original messed up family. Their trek to Texas confirms what we all already know. You can change your location, but you take your problems with you, and no place is ever really safe.from the demons in one's head and heart. "Continental Day" was the silly name I gave Columbus Day in my senior year of college, when I repurposed it as the principal national holiday in a utopian alternative United States which I created in an assignment for an American Political Thought course. (It was 1971, after all!). I called Columbus Day "Continental Day," not out of any incipient political correctness, but as a way of emphasizing the enormity of Columbus' accomplishment and its ongoing relevance for any contemporary American society. For, whatever else we are or think we are, we are first and foremost the product of the exploration and settlement of this huge continent by generation after generation of diverse peoples who immigrated here from somewhere else (until recently, mainly from Europe). Columbus, of course, is an ethnic hero for Italian-Americans.He is also a founding figure for this continent's predominantly Hispanic culture. Hence today's celebration of el día de la Hispanidad. And, of course, there were people already here on this continent before Columbus, whose distinctive history and sufferings deserve more attention than they have typically received. But October 12, 1492, was a pivotal turning point in human history when the peoples of previously separate continents, until then totally unknown to each other, came together in both good ways and bad to create something - a society and culture - completely new, of which all of us are the products. Not only our country but I personally (and almost everyone else in this continent) would literally not exist, had it not been for that original encuentro, that coming together of the "old" and "new" worlds in the building of an even newer society and culture on this American continent. Religiously, of course, that encuentro initiated the evangelization of America. In the United States, the history of that evangelization not only deserves to be celebrated in terms of its past but still speaks specifically to our current condition as a nation. Thus, writing this past week about Pope Francis' recent American tour in The New York Times (http://www.nytimes.com/2015/10/08/opinion/the-popes-subversive-message.html?_r=0), even a conservative op-ed writer, Arthur Brook,s observed how "the secret to American unity ... is to remember that we are the poor." In his column, Brooks contrasts a European Church, "historically an institution of the powerful," with the American Catholic Church," established as the church of outsiders." Throughout American history, he notes, "it has been the poorest of the immigrant groups - the Irish, Italians, and Latin Americans - who represented the face of American Catholicism. Excluded from power in their countries, the poor opted to build their lives and churches here." In an era when churches and parishes are closing, we might do well to remember that, back when we were unequivocally the Church of the poor, we were successfully building big and beautiful churches and everywhere opening parishes, schools, and hospitals. Columbus Day is a good reminder of who we are and where we came from, of whom to identify with in today's social struggles and whom not to identify with in contemporary political divisions. Sometime in the 2nd half of the 3rd century, a young Egyptian named Anthony arrived at Church, just as the Gospel story we just heard [Mark 10:17-30] was being read. The future Saint Anthony of Alexandria, the so-called “father of monks,” was 19 or 20 at the time. Hearing Jesus’ words, Anthony felt that they had been spoken directly to him. Not long after, he gave away his possessions in order to lead a life of intense self-denial in the Egyptian desert. Every since, many have followed Anthony, interpreting Jesus’ words as a call - not necessarily for everyone in exactly the same way - to embrace an evangelical style of life, formalized eventually in what we now call the vocation of consecrated religious life in the Church. Among them was the Church’s newest saint, Saint Junípero Serra, canonized by Pope Francis a few weeks ago in Washington, DC. Saint Junípero Serra gave up a career as a professor in Spain for the rugged and challenging life of a travelling missionary in far-away California. All that, obviously, was still far in the future when Jesus looked lovingly at the rich man and said, “You are lacking in one thing. Go, sell what you have, then come, follow me.” These words, we are told, caused the rich man to go away sad. So what, exactly, was the source of his sadness? Here was this man, who came to Jesus of his own accord, who all his life had, he said, observed all the commandments. But, when he heard Jesus’ invitation to go even farther, entering into a closer relationship with Jesus by changing his relationship with the world, his face fell, and he went away sad. Why? Because, we are told, he had many possessions. That, the Gospel seems to be saying, is what possessions will do to you! Our experience today is, in some way, like that of Adam [The Pope here is talking about Adam alone in the Garden before the creation of Eve]: so much power and at the same time so much loneliness and vulnerability. The remedy for Adam’s isolation was, of course, a relationship with another person, created (like him) by God. The remedy for the rich man’s isolation, Jesus seems to be suggesting, is likewise a renewed relationship with his fellow creatures, one which privileges people over possessions. Adam was lonely because he was, literally, alone in the world. Today’s individuals are lonely in a world full of people because they prize their individuality and thus suffer from a diminished solidarity with those with whom they share our common home. It wasn’t just the rich man who was shocked and dismayed by Jesus’ words. In the kind of society in which Jesus’ lived, wealth was seen as a sign of blessing – a notion which our own consumerist society seems to have taken to its ultimate extreme. No wonder Jesus’ disciples were exceedingly astonished and worried “who can be saved?” No wonder if we, who live in the richest society in the history of the world, if we too ask that same question and ought to be worried as well! Jesus’ challenge to the rich man – and, by extension, to all of us - was meant to be that kind of a radical, disconcerting challenge. For, as we just heard in the letter to the Hebrews, the word of God is living and effective, sharper than any two-edged sword, penetrating even between soul and spirit, joints and marrow, and able to discern reflections and thoughts of the heart [Hebrews 4:12]. Homily for the 28th Sunday in Ordinary Time, Immaculate Conception Church, Knoxville, TN, October 11, 2015. If tomorrow were not a Sunday, it would be the liturgical feast of Pope Saint John XXIII (1881-1963), who was Pope from 1858 to 1963. He is one of the more recently designated patron saints of the Paulist Fathers and is also the titular patron of the University Parish in Knoxville, where the Paulist Fathers have also ministered since 1973. Within months of his election, Pope John announced his intention to convoke an ecumenical council – the 21st such council in the Church’s almost 2000-year history. After three years of preparation, the Second Vatican Council opened on October 11, 1962, and concluded four years later on December 8, 1865. The imminent 50th anniversary of the Council’s conclusion will be celebrated as the beginning of the Extraordinary Jubilee, the Holy Year of Mercy. “It often happens, as we have learned in the daily exercise of the apostolic ministry, that, not without offense to Our ears, the voices of people are brought to Us who, although burning with religious fervor, nevertheless do not think things through with enough discretion and prudence of judgment. These people see only ruin and calamity in the present conditions of human society. They keep repeating that our times, if compared to past centuries, have been getting worse. And they act as if they have nothing to learn from history, which is the teacher of life, and as if at the time of past Councils everything went favorably and correctly with respect to Christian doctrine, morality, and the Church's proper freedom. We believe We must quite disagree with these prophets of doom who are always forecasting disaster, as if the end of the world were at hand” (Gaudet Mater Ecclesia, 8). This famous speech by Pope Saint John XXIII often brings my mind back to an earlier Council - very early in the Church's life, long before Nicea even, namely the apostolic Church's early experience of "synodality" in Acts 15. Faced with a situation which the first Christians had apparently not expected and for which it seemed a clear path had not been precisely set for them in advance, they nonetheless were confident that the Risen Lord had given the Holy Spirit to the Church to guide her to a correct solution and that the path to such a solution lay in deliberation and debate. Thus, when the way forward had been identified, it was announced as the decision of the Holy Spirit and of us. I have no more idea than the next person what may be transpiring in the Synod's deliberations. As the very knowledgeable John Allen wrote only yesterday: "We’re not really covering the synod at all. For the most part, we’re covering people telling us about the synod, which is an entirely different enterprise." That said, we do at least have the first reports from the small groups that have been meeting this week. Four of them have been English-language groups, each of which has issued its short report (relatio). Of course, without reading the reports of the other language-groups, I obviously have no way of knowing how typical the concerns expressed in the English-language groups are of the concerns expressed by the Synod Fathers as a whole. But, based on the limited sample afforded by the English-language groups, some patterns have emerged. Across the board there seems to be some dissatisfaction with the Synod's working document (Instrumentum Laboris). Circulus Anglicus A was concerned about "the overly bleak description of the contemporary scene" and called for more attention "to theological reflection on the faithful, loving married couple and family, who, so often heroically, live an authentic witness to the grace of the the family." Similarly, Circulus Anglicus B said "the analysis of the difficulties which the family faces was too negative," and likewise witnessed to families who daily "try to make god's dream their dream." Circulus Anglicus C called for "a less negative reading of history, culture, and the situation of the family at this time." Admittedly, that comment could be interpreted in more than one way, but the relatio also called attention to "remarkable families, many of them Christian, heroically so at times." Finally, Circulus Anglicus D suggested "the IL should begin with hope rather than failures because a great many people already do successfully live the Gospel's good news about marriage." On the other hand, Circulus Anglicus C warned against "the danger of lapsing into an idealized, removed, and disembodied sense of family ... which can end up inhabiting a somewhat bloodless world rather than the real world of families in all their variety and complexity." And Circulus Anglicus B noted "the inadequacy of the pastoral support that families receive from the Church on their itinerary of faith." The various reports also called for greater attention to families with particular difficulties - e.g., disabled members and migrants. So, overall, there seems to be a serious desire to see a greater emphasis on supporting families in their challenging vocation, even in spite of the many socio-economic and political problems families face, and a desire that such an emphasis should be more explicitly religious rather than sociological and less preoccupied with narrowly Western, "Euro-centric" concerns. It should be an interesting next two weeks!